The lemon is a very versatile fruit. It can be used to season and prepare food, or as an ingredient in several different delicious recipes for sweets and desserts. But its uses don’t stop there: in addition to its numerous health benefits, the lemon can be a great addition to your cleaning supplies! Instead of using store bought disinfectants that contain dangerous chemicals, try using lemon juice the next time you clean the house. Due to its acidity, it’s able to remove dirt and stains efficiently. To eliminate fat or grease stains, simply dilute the fruit juice in water and clean using a cloth. 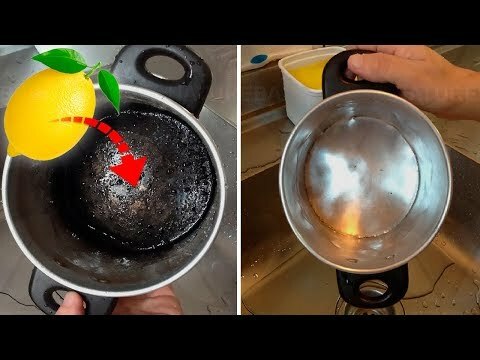 If it’s something a little harder to get out, like the cooking grease found on pots and pans, just rub a lemon on your steel wool before you wash dishes. As much as we try to keep them clean, wooden cutting boards just always look dirty. You can solve this quickly by sprinkling sea salt and a bit of lemon juice on the board. Let it sit for five minutes, then scrape the dirty liquid off the board and into the sink. Then rinse it well with warm water and a clean sponge or cloth. If you think your refrigerator doesn’t smell as good as it used to, or that the trash stinks, even when it’s empty, try lemon juice. Place lemon peel in places where there’s an unpleasant odor, and wait while it absorbs all the bad odors. Cover the pan with just enough water to cover all the crusty, burnt areas. Cut 1 or 2 unpeeled lemons into large pieces and place them in the pot. Bring the water to a boil and then let it simmer. After that, turn off the heat, let the pan cool off and throw out the water and lemon pieces. Then scrub it gently with a soft brush or sponge and watch as the burnt part comes off easily. Finish by rinsing the pan in cold water.